The wooden signs on LaGrange Road/Hwy. 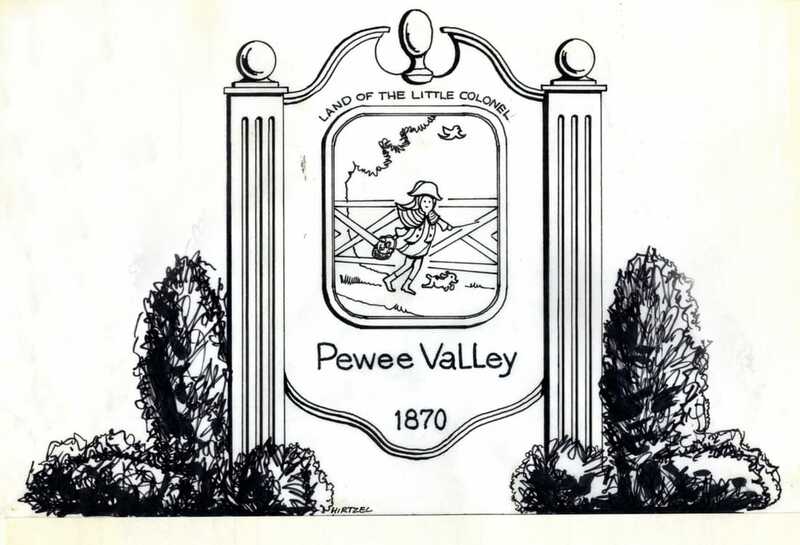 146 that mark Pewee Valley's boundaries proclaim Pewee Valley as "Land of the Little Colonel." That nickname derives from the title of author Annie Fellows Johnston's autobiography, published in 1929 and written while she was living at The Beeches. Thanks to an anonymous donor and Peweean John Morgan, the Pewee Valley Museum has original copies of all but three of Johnston's works in our collection. Popular author Annie Fellows Johnston made Pewee Valley the "Land of the Little Colonel" with her best-selling children's book series. The Indiana native published the first volume, "The Little Colonel," in 1895, after visiting relatives in Pewee Valley. Seventeen years later, she completed the series with the publication of "Mary Ware's Promised Land" in 1912. By then, she was living in The Beeches, which still stands today on Central Avenue. Like many writers, she drew inspiration from her own life experiences. Many of the characters and settings for the early books in the "Little Colonel" series were largely based on real people, places and events in Pewee Valley. In some instances, such as Edgewood, The Beeches, and The Locust, she referred to places by their real names. In others, she used pseudonyms, turning Pewee Valley into Lloydsboro Valley and the Kentucky College for Young Ladies into Lloydsboro Seminary. As the series progressed, the books incorporated people and places from Annie's travels with her stepson John, who suffered from tuberculosis. Before the discovery of antibiotics, very few treatments were available for the "white plague." Doctors generally prescribed rest and fresh air, and TB sanitariums and tent communities sprang up across America. 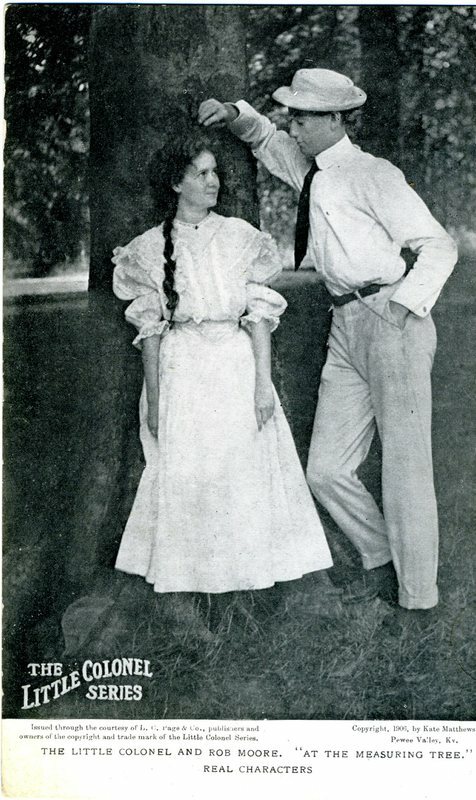 Annie, her stepdaugher Mary, and John spent time in California and Arizona, before settling in Boerne, Texas, where the hospitable hill country climate attracted many "lungers." 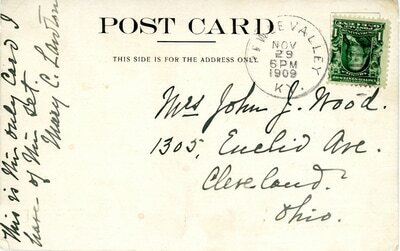 It wasn't until after John's 1910 death that she made Pewee Valley her home. The series eventually included a dozen volumes, a children's diary called "The Good Times Book" and two paper doll books, one for the Little Colonel and one for Mary Ware. It was a publishing phenomenon the likes of which few children's authors have ever achieved. Millions of books were sold and the stories were eventually translated into over 40 languages, including Japanese and Braille. In 1906, Annie's publisher, the L.C. 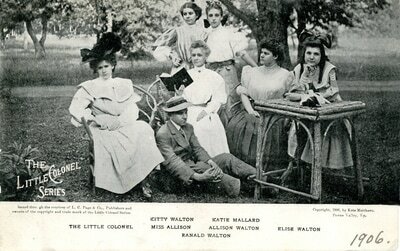 Page & Company, published a series of official Little Colonel postcards featuring photos of some of the real people and places that inspired the characters and settings in the books. Many of those photos were taken by Pewee Valley photographer Kate Matthews, who became a character in the stories as well. And in 1908, the McLoughlin Brothers, Inc., began producing Little Colonel puzzles and a card game. 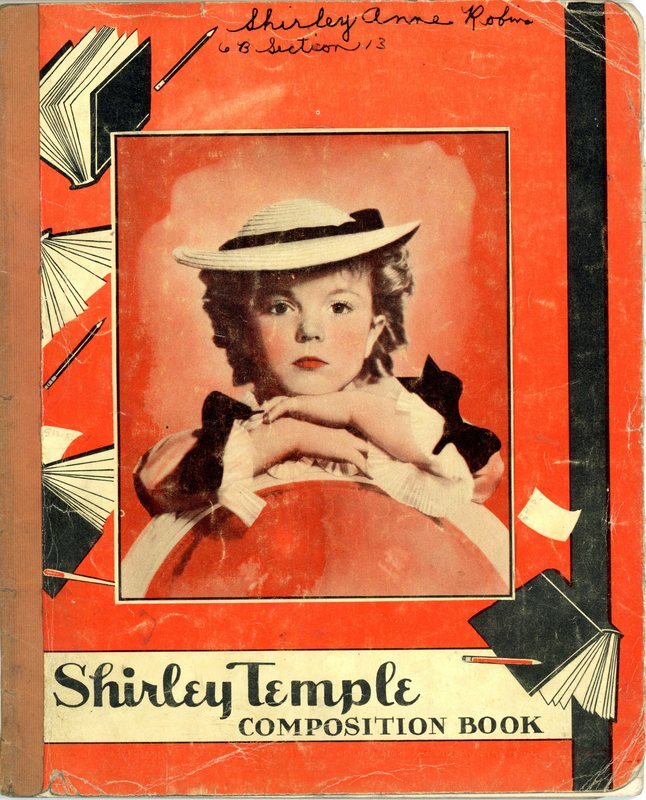 A Shirley Temple Composition Book for Grades 1-8, featuring the child star dressed in a "Little Colonel" costume. Western Tablet and Stationery Corp. copyrighted the composition book on December 10, 1935. ​In 1935, four years after Annie Fellows Johnston's death, Fox Studio made the first book into a movie starring box office-draws Lionel Barrymore and Shirley Temple. The film spawned a torrent of new Little Colonel merchandise. Clothing, book reprints featuring scenes from the movie, fabric, sheet music, a board game, playing cards for bridge, composition books and dolls were among the items marketed to children -- and adults -- after the film premiered. 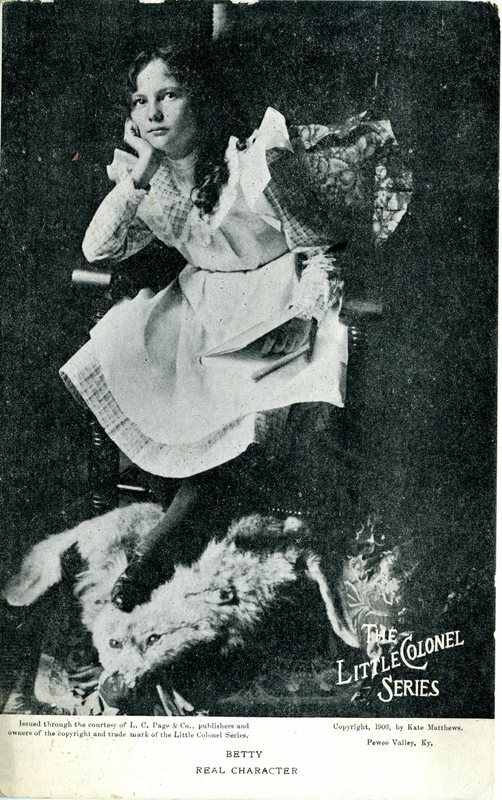 Shirley Temple Bridge Cards featuring her dressed in her Southern Belle outfit from the "Little Colonel" movie. Framed Herald-Post story hanging at the Samuel Culbertson Mansion in downtown Louisville showing photos of some of the Peweeans who served as models for characters in the Little Colonel stories. ...If Miss Johnston took everyone upstairs who came to the Beeches (editor's note: to see Annie Fellows Johnston's writing office), the stairs would have worn out a generation ago. And people are still coming. They are young and old, they come before breakfast and after supper. They are "just driving through," as two middle-aged couples told me when I met them there on their way from Florida to Providence, R.I., "a little out of the way, but when we realized we were within a few hundred miles, we had to detour." 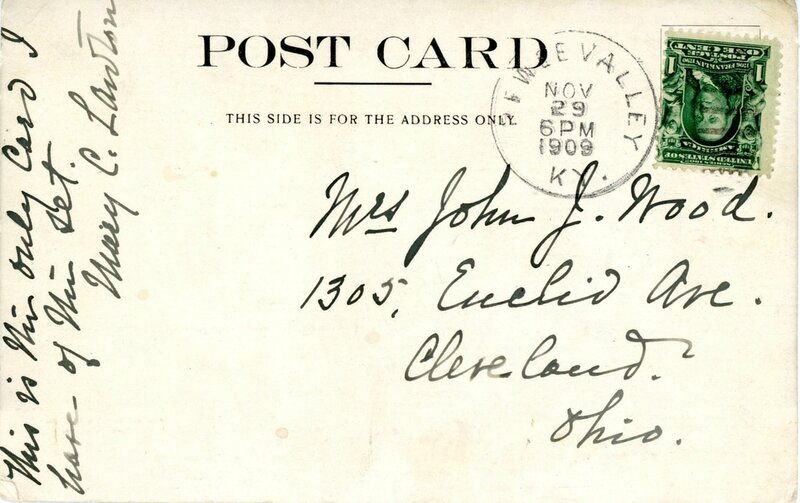 ...They come from Edinburgh, Ind., and from far-off Connecticut (the curator of the rare book department of Yale University Library, anxious to visit the "one place I must see in Kentucky -- Pewee Valley.") They come out from Louisville and from Iran. There were a missionary from Africa, and a lady from the valley of the Thames, who said, "All just as she described it, you know." Even today, more than a century after the first book's debut, the Pewee Valley Historical Society still receives occasional requests for tours from "Little Colonel" fans and scholars. To learn more about the real people and real places Annie Fellows Johnston wrote about in the "Little Colonel" stories, visit our sister website, littlecolonel.com. The site also includes a complete listing and descriptions of all the books and special editions in the "Little Colonel" series. Many of them are out of copyright and are available to read online on the website. First copyrighted in 1900, "Asa Holmes or At the Cross Roads" takes a look at the lessons to be learned at any small town crossroads store during every season of the year. The main character in the book is Asa Holmes, an 85-year-old retired miller and fireside philosopher. Published in August 1902, "Aunt 'Liza's Hero" is a compilation of six short stories Annie Fellows Johnston had originally written for the Youth's Companion magazine. In addition to the title story, the book includes: The Captain's Celebration, ​Jode's Circus Money, Jimmy's Errand, Washington's Birthday at Hardyville and An Old Daguerreotype. 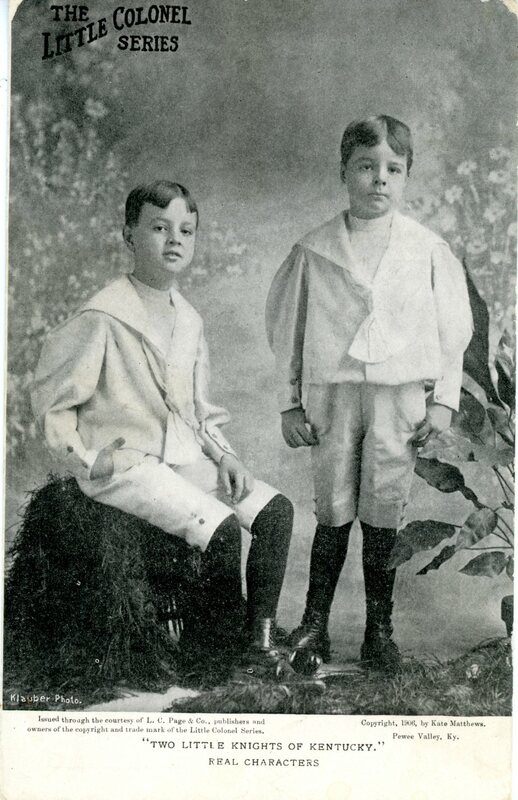 First published in 1893 before Annie Fellows Johnston had become a hot commodity in children's literature, "Big Brother" is the story of two boys. The devotion and care of Steven, himself a small boy, for his baby brother, is the theme of the simple tale. "Cicely and Other Stories" was first published in 1901 by the Perry Mason Company. L.C. Page & Co. brought out the Cosy Corner edition in May 1902. The book is a compendium of five short stories originally published in Youth's Companion and Forward magazines: Cicely, Alida's Homeliness, The Hand of Douglas, Elsie's "Palmistry Evening," and Their Ancestral Latchstring. 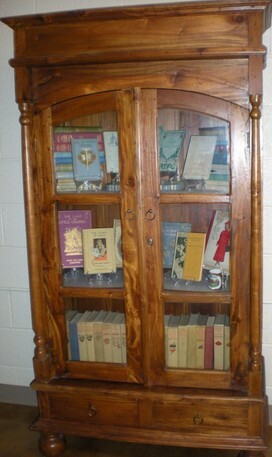 The Pewee Valley Museum's copy was donated by avid Annie Fellows Johnston collector John Morgan. Annie Fellows Johnston originally wrote "Flip's 'Islands of Providence'" for the Trustees of the Presbyterian Board of Publication and Sabbath-School Work, which published it in 1902. The book was picked up by L.C. Page and Co. and republished as part of their Cosy Corner series in 1903. The museum's copy was donated by John Morgan. "For Pierre's Sake" was a posthumous collection of Annie Fellows Johnston's short stories that were in the works when she died in 1931. It was published by L.C. Page and Co. in 1934. Unfortunately, the book is still under copyright protection and isn't available yet to read online. Written while Annie Fellows Johnston was living in Pewee Valley and published in 1916 and 1918, this pair of books was inspired by World War I and includes a character named Mrs. Waldrop -- in real life Mamie Lawton, who by that time was living in the Washington, D.C. area. Mamie also appeared in the "Little Colonel" books as Mrs. Walton and remained a close friend of the author's from the time the two met ca. 1897 until Annie's death in 1931. 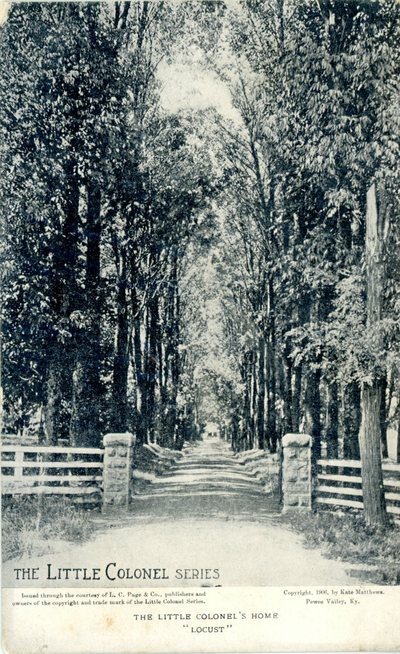 The books were popular with soldiers stationed at Camp Zachary Taylor in Louisville, and many made the trek to Pewee Valley to visit The Beeches . In "It Was the Road to Jericho," Annie Fellows Johnston tells the story of the Good Samaritan. The book was copyrighted in 1919, while Annie was living at The Beeches and was illustrated by John R. Neill. It was published by the Britton Publishing Co. in New York. The museum's copy was donated by John Morgan. Published in 1906, "Mildred's Inheritance" is a compilation of three short stories that includes Mildred's Inheritence, the story of a lonely English girl who comes to America and is befriended by a sympathetic American family who are attracted by her beautiful sparkling voice; Just Her Way; and Ann's Own Way. The stories were originally written for the Trustees of the Presbyterian Board of Publication. A story of two adorable children, with the Christmas spirit on every page. Will'm and Libby, two motherless little ones, go quite wild when they first hear of Santa Claus, and send him a letter—Libby asking for a ring, Will’m for a ride on a Pullman. Just before Christmas the children learn that they have a new mother and are to leave Grandma West to go to her and their father. The stories they have heard of " stepmothers" make them unhappy, and they start off miserably on the Pullman on an all-day journey home. But they meet a charming girl, gay in red coat, and holly, who gives them such a happy time that they recognize her for Miss Santa Claus. She comforts them with a new idea of stepmothers, tells them a beautiful fairy story about love and obedience, and fills their stockings with gifts. And in the morning the children wake to find their new mother a very real and tender mother. Some of the very best of the story is of the days that follow. First published in 1904, "The Quilt That Jack Built" is composed of two short stories: The Quilt That Jack Built and How He Won the Bicycle. Both feature young boys learning virtues and values that will make them better men and help them achieve success in their future careers and in life. "Songs Ysame," a compilation of poems written by Annie Fellows Johnston and her sister Albion Fellows Bacon and copyrighted in 1897 by L.C. Page and Co., is available to read online. "What the Deaconess Does, or Where the White Ties Lead: A Story Describing Real People, Real Places, Real Work" is a short 45-page volume originally published by the Deaconess Advocate in 1899. It has not been digitized. The Filson Historical Society in Louisville Ky., has a copy in their collection. "Little Man in Motley" was copyrighted in 1918 by L.C. Page and Co. as part of their Cosy Corner series. It has not been digitized and the closest copy is available at Western Kentucky University's Helms-Craven Library. Annie Fellows Johnston: What Was Real?